Zola Jesus will release her new album, Conatus, on Souterrain Transmissions on September 26th, 2011. The follow up to 2010’s Stridulum II, the album’s release will be preceded by festival dates this summer, with headline shows around release coming soon. In the last three years Nika Roza Danilova has gone from being an outsider experimental teenage noise-maker to a full fledged internationally celebrated electronic pop musician. It was a huge feat to accomplish, and despite her age (young), her geography (mid-western, desolate), her accelerated scholastic requirements (high school and college were completed in three years each) and her diminutive physical size (4”11, 90 lbs) she has triumphed. She has emerged as a figurehead– a self-produced, self-designed, self-taught independent woman. Zola Jesus is not a band; it is a solo project. Zola Jesus is not a singer; she is a musician. It has always been so. That is not to say the people who have helped her along the way were not deeply important. Her irreplaceable live band, who’s drummer Nick Johnson lends a hand on several tracks here, and her friend Brian Foote who co-produced this album in addition to the live string players (Sean McCann, Ryan York) who contribute here were all crucial in the process. Nika however, is a woman who can command a room, any room, without needing a band, a stage, or even a microphone. Her voice is unmistakable; it cuts right to the core. Wer in den letzten Jahren den Finger an den Puls elektronischer Musik gelegt hat, dem wird APPARAT in der ein oder anderen Ausformung begegnet sein – soviel kann man mit einiger Sicherheit sagen. Sascha Ring, der Berliner Musiker, der unter jenem Alias firmiert, war eine der treibenden Kräfte elektronischer Musik der letzten Dekade. In dieser Zeit hat er drei umjubelte APPARAT-Alben herausgebracht – und gefeierte Gigs in unzähligen Clubs und Festivals rund um den Planeten gespielt. Sein viertes Album erscheint nun im Herbst 2011, der vorab gelaunchte Track “Ash/Black Veil” hat in wenigen Wochen bereits über 100.000 plays auf Soundcloud erzielt. The Devil’s Walk, eine Verbeugung vor Percy Bysshe Shelleys gleichnamigem satirischen Gedicht aus dem Jahr 1812, ist das Album, mit dem Sascha gewissermaßen erwachsen wird und sein Spiel neu aufstellt. Hatte er zuvor auf dem legendären Elektro-Label Shitkatapult veröffentlicht, dessen Mitbetreiber er für einige Jahre war, ist The Devil’s Walk sein erstes Album für Mute. Und wenn bereits sein letztes Album Walls (2007) eine Bewegung weg vom Dancefloor andeutete, so vollendet das neue Werk mit seiner kontemplativen Dream-Pop-Sigur-Ros-Signatur diese Wende und amalgamiert epische, emotionale Texturen zu dichtem Sci-Fi Soul. Als missing link zwischen Steve Reich und RADIOHEAD evoziert The Devil’s Walk jene schwer fassbare euphorische Melancholie die einen dazu antreibt, die Arme vor Freude in die Luft zu werfen, während einem gleichzeitig die Tränen die Wangen hinunter rinnen. Einige kennen Sascha sicher auch als Mitglied der Gonzo-Elektro-Supergroup MODERAT, einer Kollaboration mit seinen eigenwilligen Berliner Homies von MODESELEKTOR, die im Jahr 2009 ihr Debüt veröffentlichten, worauf hin die Truppe sich auf Einladung Thom Yorkes unversehens im Vorprogramm von RADIOHEAD wiederfand. Diesen März spielten MODERAT den vorerst letzten Gig einer ausgelassenen wie ausladenden Welttournee beim Bloc Weekend Festival in Minehead. Andere wiederum mögen sich an die taumelnden, selig machenden Synths erinnern, die Sascha 2006 gemeinsam mit Ellen Allien unter dem Namen ORCHESTRA OF BUBBLES herausbrachte. So oder so – alles, was man über Sascha Ring und APPARAT wissen will, liegt in dieser fabelhaften Platte. Der Teufel steckt nicht nur im Detail, er ist in jeden Groove eingeschlossen. Und mit Sascha an den Reglern hat er natürlich all die guten Melodien auf seiner Seite. Mote-Evolver continues to push on into uncharted territories of electronic music with the ‘Parallel Series 1’, the first in a new series where 2 artists are featured side by side – contrasting and complementing. A dedicated producer with over than a decade of experience, British born ASC goes head to head with Luke Slater’s rather rare L.B.Dub Corp guise over 4 tracks of vivid new techno. ASC’s textural, earthy and spacious ‘Slow Burn’ does exactly that. Building from reduced layers of paranoid percussion and hot fragments of sound, he creates a bass heavy world of machine funk that leans pleasingly towards more abstract zones. The somewhat brighter ‘Transit’ floats on a bed of liquid reverb, punctuated by jittering percussion, digital interference and brooding deep atmospheres. Certainly a trip into the outer limits, ASC’s uncompromising sound continues to grow. then disintegrate with addictive hypnotism. 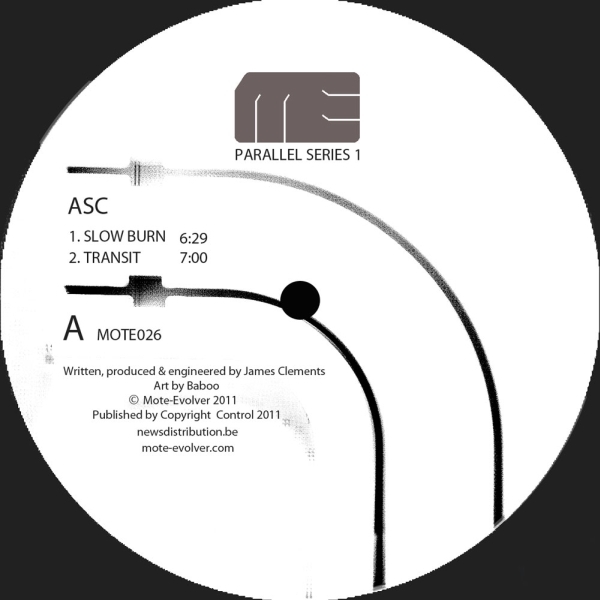 “Slow Burn” by ASC is sick tool to push the audience from one side of the dancefloor to the other. A lit bit angry? “Transit” by ASC is filled with brigther sounds. Something to reduce the speed. “Lurchers Dub” by L.B. Dub Corp … is frisky with a slight note of Jazz. “Native Dub” by L.B. Dub Corp .. is dubby at all. Definitely another MOTE release I love. I guess Mote-Evolver will be my techno label of the year in 2011.